The post that you are reading is a very different one than the first one that I originally wrote this evening. 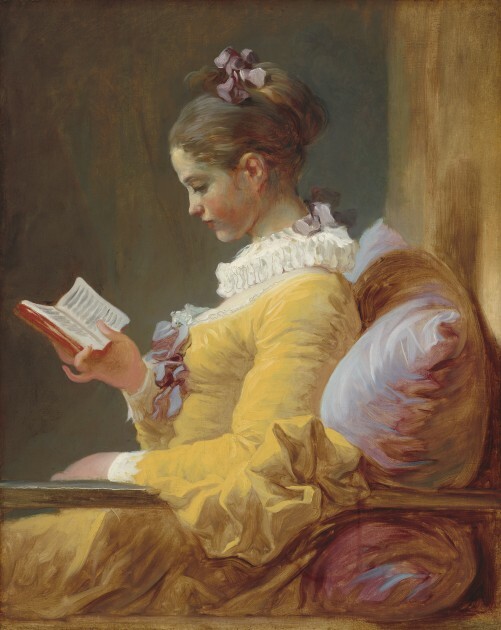 I recently read in The Art of Reading: An Illustrated History of Books in Paint that Berthe Morisot was the descendant of the painter Jean-Honore Fragonard, and I hoped to write a post that explored that relationship between the two. However, as I researched, I found conflicting information about how Morisot was either the granddaughter of Fragonard, the great-niece of Fragonard, or the great-great-niece of Fragonard. So I began to comb through the genealogical timelines of the Morisot family and realized that I couldn’t find a clear ancestral connection between the artists at all. Dozens of sources claim that this connection comes through the family of Berthe’s mother, who was named Marie-Joséphine-Cornélie Thomas, although as of yet I can’t find the origin of this claim in writing. I can assert though, that Morisot is not the granddaughter of Fragonard: her paternal grandparents were Tiburce Pierre Morisot and Claude Elisabeth Morisot; her maternal grandparents were Jean Simon Joseph Thomas and Caroline Françoise Marie Mayniel. Chronologically, it seems to be that Fragonard lived four generations before Morisot. Her only two great-grandparents that I know of (her grandmother’s parents, whose names were Jean Henri Mayniel and Josephine Anne Victoire de Ménard) were both born in 1760. That doesn’t go back far enough to meet up with Fragonard, who was born in 1732. Other branches of Berthe Morisot’s family line don’t seem to go back far enough, at least through online genealogical records. I finally found an archived excerpt of Anne Higgonet’s 1995 book Berthe Morisot, which explains that “family tradition claims indirect descent from the painter Fragonard.” Is this actually just a “family tradition” then, but an unsubstantiated one? If that’s the case, we need to stop repeating it in scholarship or take Higgonet’s approach to explain the relationship has just been merely “claimed” or rumored through family tradition. I can see how it is appealing to connect these two artists together. Fragonard painted many outdoor scenes that depicted aristocrats engaged in romantic or pleasurable pursuits. Likewise, Morisot painted plein air and often depicted members of the bourgeoisie. I also like thinking about how they both were drawn to the subject matter of a woman reading: Fragonard’s Woman Reading (c. 1776, shown below) was made almost exactly one hundred years before Morisot’s Reading (The Green Umbrella) from 1873 (shown above). It is also clear to see how Fragonard’s lively brushwork (especially seen in the fabric of the painting) helps to open the door for the loose, painterly strokes of the Impressionists like Morisot. One thing is certain: if Morisot was a descendant of Fragonard, she never met the artist. Fragonard died in 1806 and Morisot was born in 1841. The one thing that makes the ancestral connection believable in some regard is that Fragonard’s reputation and career fell into a decline during the end of his lifetime due to the upheaval of the French Revolution.1 He even remained relatively unknown for the first half of the 19th century and was even omitted from scholarship.2 So he would have seemed like an odd choice to claim kinship in the 19th century, unless the kinship either was actual or derived from family lore that began in the 18th century! 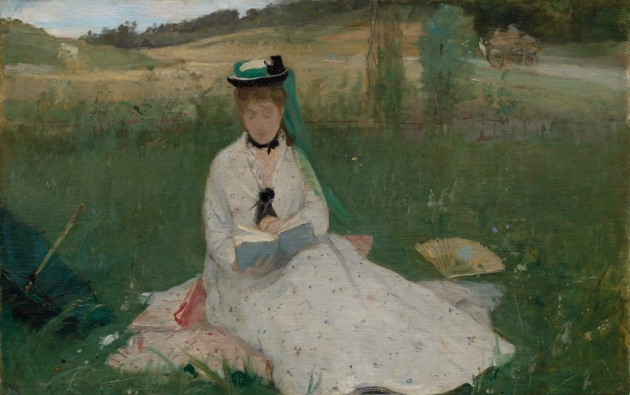 If you can fill in the genealogical record or add to the connection (or lack thereof) between Fragonard and Morisot, please share! I’m also curious to learn how this “family tradition” has been upheld in scholarship – who was the first to pen down this connection? Was it Berthe Morisot herself or it is in an Impressionist review? So far the earliest mention I have found is from 1904. Regardless of the ancestral connection, I am particularly struck at how often this connection has been repeated in scholarship and publications. On one hand, it is a neat connection if it is true, simply to show how art was a familial pursuit. But I also wonder if this connection to Fragonard was also used to legitimize the contributions of a female artist in the male-dominated world of art. The radio silence on my blog has been deafening for me, but luckily I’ve been able to do some writing over the past few months. The William Morris Society in the United States contacted me a few months ago, after reading my 2016 post on Kehinde Wiley and William Morris. 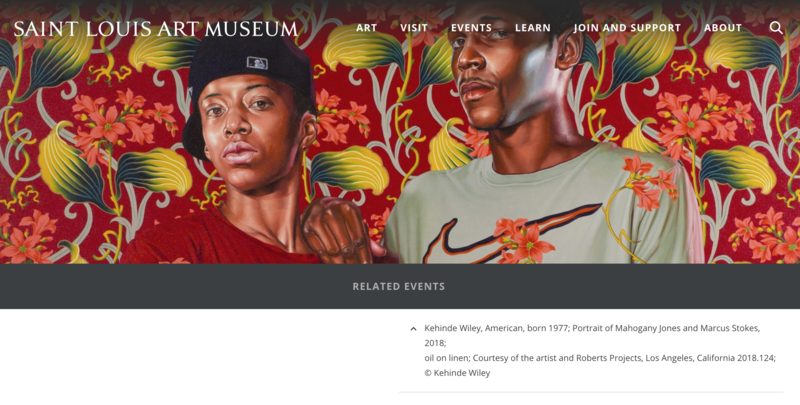 I expanded this initial post into a new one for their “News from Anywhere” webpage with updated information about a current Kehinde Wiley show at the Saint Louis Art Museum. And check out the gorgeous catalog cover for the exhibition! I am really sad that I am unable to see the exhibition Reflections: Van Eyck and the Pre-Raphaelites that is going on at the National Gallery in London right now (until April 2, 2018). This show has some of my favorite artists and works of art, including Van Eyck’s Arnolfini Portrait, which is one of the first works of art that I came to love as a teenage student. 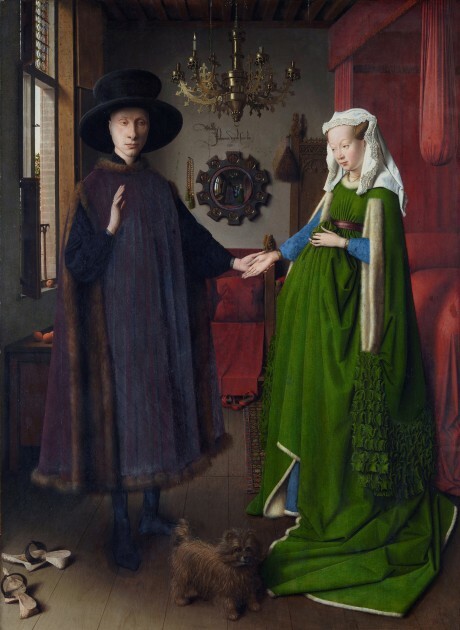 I also love thematic exhibitions that link works of art by their content (such as symbols and subject matter): this exhibition revolves around the inclusion of the convex mirror in both Van Eyck’s and the Pre-Raphalites’ art. What a fun and novel idea for a show! Even though I can’t travel to England for this exhibition, I look forward to reading the catalog. 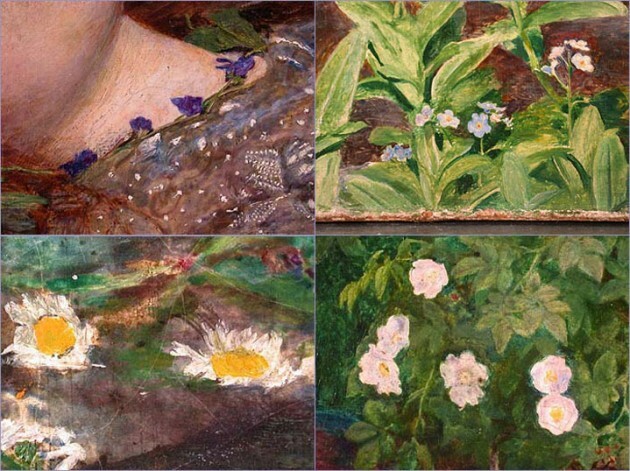 I think this connection to Van Eyck is a really great way for students to understand how the Pre-Raphaelite Brotherhood style is unique and different from the other art produced in Britain in the 19th century, not only in terms of subject matter but also style. 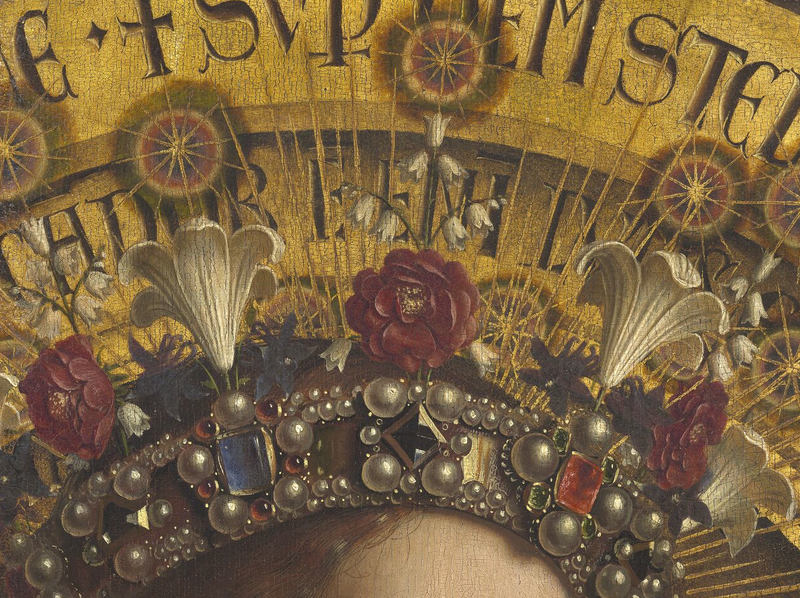 Van Eyck’s art is highly detailed and has very bright, saturated colors; such features are also a hallmark of Pre-Raphaelite art. As a Northern artist, Van Eyck was influenced by the Aristotelian mindset that places value on finding knowledge through empirical observation. 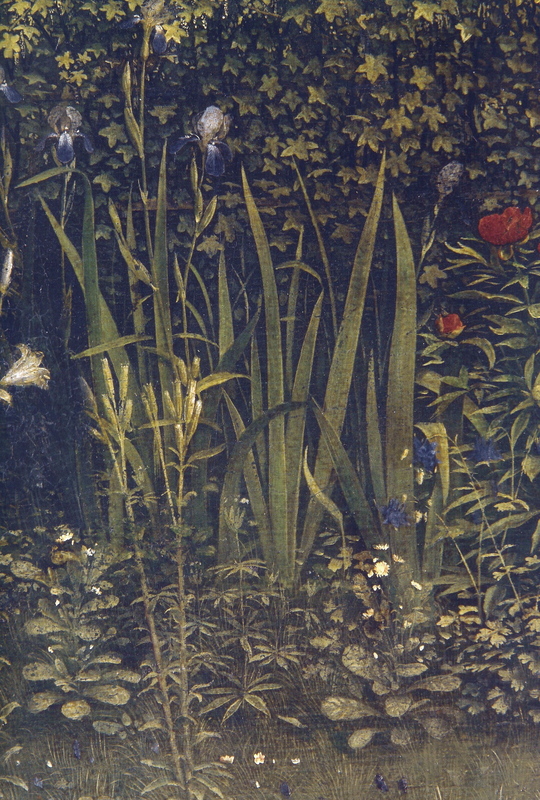 This parallels with how the Pre-Raphaelites, as influenced by the art critic John Ruskin, sought to depict truth and find a moral, virtuous foundation by studying nature. 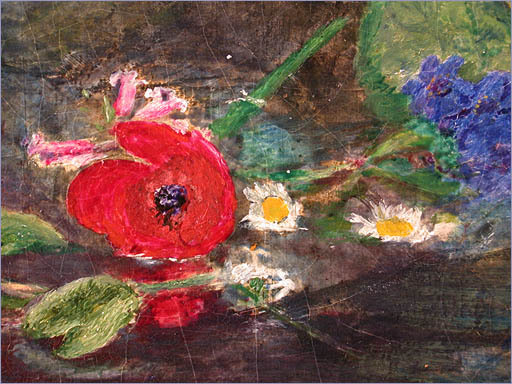 All of these artists were compelled to look closely at the world around them. As a gardener, I especially like to think about how Van Eyck and the Pre-Raphaelites are similar in how they studied the natural world through plants and flowers. 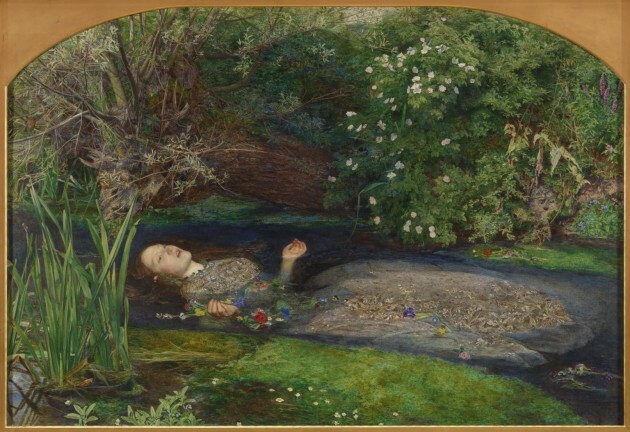 One of my favorite Pre-Raphaelite paintings is Millais’ Ophelia (1851-52), and a Smarthistory video includes amusing anecdotes about the practical frustrations that Millais experienced by going into nature to paint this scene. This painting has a lot of very specific flowers included therein, which are part of the Shakespearean story of Ophelia from the play “Hamlet.” Millais took special pains to make sure that all of the plants were identifiable, especially since they each held symbolic value. Millais even furthered the floral motif by depicting his model in an embroidered floral dress which he bought specifically for inclusion in the painting. Jan and Hubert Van Eyck, Ghent altarpiece (Adoration of the Mystic Lamb), 1432. Oil on wood panels. As with Millais, Van Eyck included flowers for symbolic purposes, and many of them relate to the Virgin. For example, white lilies are associated with the Virgin because they are a symbol of purity. Roses are associated with the Virgin: her virginity was compared to an enclosed garden and she was known as by titles such as the Mystical Rose. Although these artists were separated by about 400 years, there are some definite similarities in their art. Millais and Van Eyck had a love for depicting fine details, a similar interest in using symbols to depict literary or biblical themes, and a devotion to accurately depicting nature. If anything, I think that Millais had an easier time depicting nature than Van Eyck, since the recent invention of oil paint in tubes enabled Millais to go outdoors to paint. As I myself sit indoors and impatiently wait for spring to begin, I especially love these vibrant, detailed paintings because they help keep flowers alive for me all year long. When I saw the Kritios Boy on display in Athens (back in 2003, in the old version of the Acropolis Museum), I was struck by how the statue was smaller than I anticipated. I naturally assumed that the scale of the sculpture was akin to the large size of the reproductions I had seen in my editions of Gardner’s Art Through the Ages. However, this work of art, which had loomed so large in my mind as an undergraduate, is only 3’10” (1.17 m) tall. In truth, though, the Kritios Boy’s role in art history has been anything but small. This figure dominates many canonical art history books as the forefront example of the Early Classical period (also called the Severe Style). And, in some ways, we know more about the start of the Early Classical period because of the Kritios Boy. One of the assumptions that the Kritios Boy was made before Persian attacks is that the body was found with other works of art in the Archaic style. If this is the case, then the Kritios Boy was a leader in introducing the Classical Style. This can segue into a discussion of pinpointing the beginning of the Early Classical period: before the Kritios Boy was excavated in 1865, the popular starting date for the Early Classical period was 480 BC. Winckelmann’s Geschichte der Kunst des Altertums (1764) pinpointed the Persian Wars of 480-479 BCE as the starting point for the Early Classical periods, since the victorious Greeks would have felt a sense of self-confidence, capability, and worth. 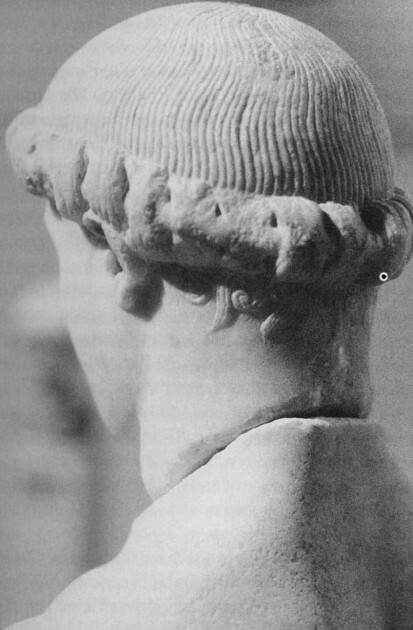 However, if the Kritios Boy predates 480 BCE and therefore was attacked in the Persian sack of the acropolis, this means that the shift in artistic style took place before the time that Winckelmann pinpointed. Instead, it seems more likely that the Early Classical period should be pinpointed to the Battle of Marathon in 490 BCE, in which the Greeks won a decisive victory over the Persians. There are other nuances to this argument as well, which are discussed by Hurwit and Stewart. However, overall one can say that this post-Persian argument places the Kritios Boy not as an instigator of the Early Classical style, but within a greater continuum of (and likely as a response to) vanguard stylistic elements that appeared in other works of art. If this is the case, I wonder if textbooks should rethink the way that the Kritios Boy is introduced to art history students? One has to be careful to make stress that the Kritios Boy is indicative of these changes in style, but our loss of extant examples and a truly clear understanding of Perserschutt chronology prevent us from knowing whether the Kritios boy was an instigator or follower of the nascent Severe Style. 3 Jeffrey M. Hurwit, “Kritios Boy: Discovery, Reconstruction, and Date,” American Journal of Archaeology , Vol. 93, No. 1 (Jan., 1989): 61-62. 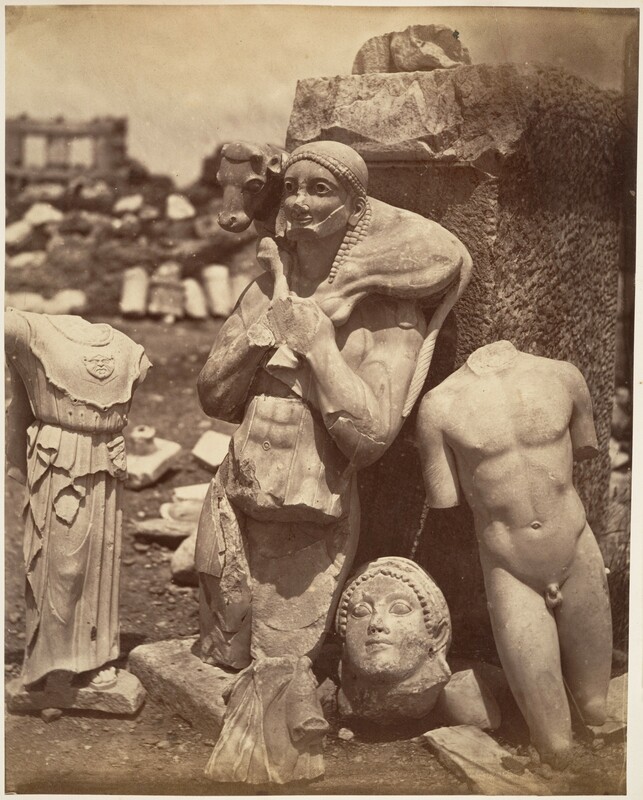 4 From 1865-1888, the Kritios Boy’s body was attached to the head of a youth, known as Acropolis 699. To see an image of this inaccurate reconstruction, see Jeffrey M. Hurwit, “Kritios Boy: Discovery, Reconstruction, and Date,” American Journal of Archaeology , Vol. 93, No. 1 (Jan., 1989): 51. It could be that the head conjoined with the Kritios Boy today is not the original head, but a head that served as an ancient repair for the original head; such a theory supports why both the body and head both are chiseled away, to allow for as neat of a fit as possible. Hurwit argues that the head is original and always was meant to be with the body, since there is not evidence of tool marks or recutting on the broken sides of the head and body. See Hurwit, p. 56-59. For those who follow my blog, you may have noticed that I have been researching stars and celebrities of the mid-20th century over the past several months. 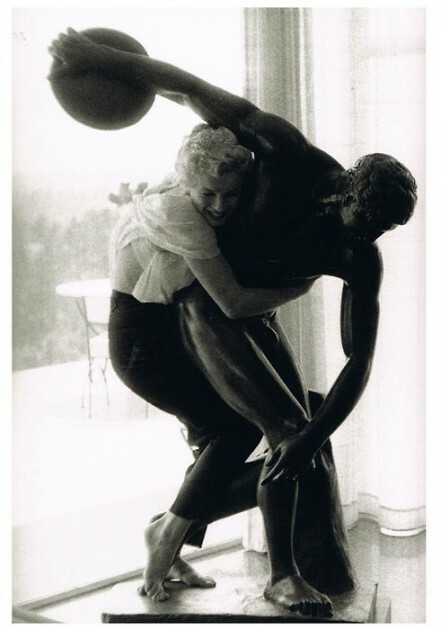 Out of all of the people that I have studied thus far, Marilyn Monroe stands out as one of the people who is most interested in the Western artistic tradition. I was surprised to make this connection, because it never occurred to me that Marilyn would be interested in visual art. She was one of the most exciting human beings I had ever met. She talked about the Renaissance and made it sound ten times more important than the Studio’s biggest epic. I drank in everything she said. I met Michelangelo and Raphael and Tintoretto. There was a new genius to hear about every day. I was so touched to learn about the great impact that this teacher had on Marilyn Monroe. I can only hope to be as inspiring of an art instructor! After the course, Marilyn continued to learn about art, and I was especially amused at an anecdote about how she read a disappointing book about Goya (which, fortunately, didn’t hinder her enthusiasm for Goya’s art). 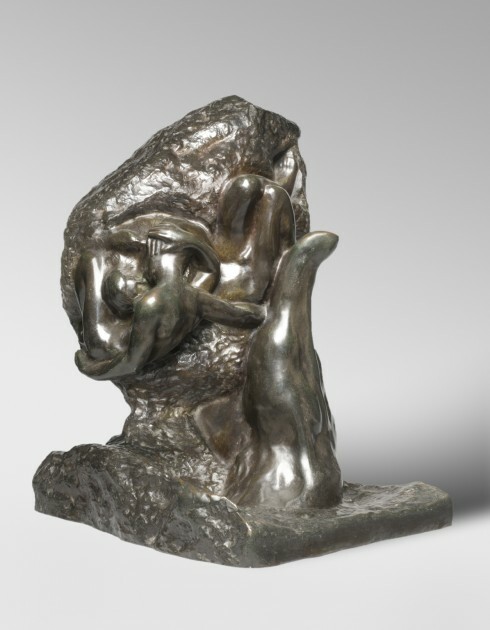 In fact, Marilyn liked The Hand of God so much that she bought a bronze sculpture of in 1962 (similar to the one shown above), for more than one thousand dollars. 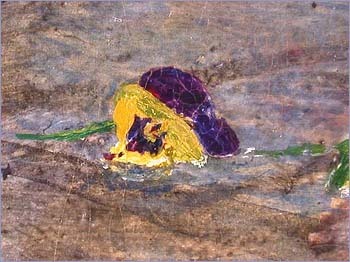 This was the last year of Marilyn’s life, and her emotional well-being was already unraveling. She promptly brought the statue to her psychiatrist and engaged in a bizarre and troubling conversation in which she kept asking the doctor to tell her what he thought the work of art meant. 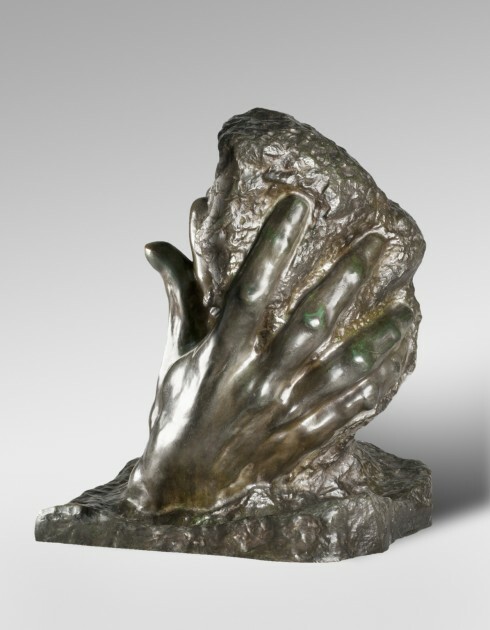 I think it’s very interesting that Marilyn felt an affinity with this particular sculpture near the end of her difficult life: the Rodin Museum says that this hand was used as a study for Rodin’s “The Burghers of Calais,” in which the hand gestures express farewell and despair. Marilyn collected other art, too. I’m particularly intrigued that in July 1955, she purchased a bust of Queen Nefertiti for her Waldorf-Astoria apartment in New York (although I can’t find information as to whether this was an authentic bust or a copy of the famous bust located in the Neues Museum in Berlin). As a well-established symbol of feminine beauty, it is intriguing to me that she would be drawn to an idealized image of Egyptian beauty. 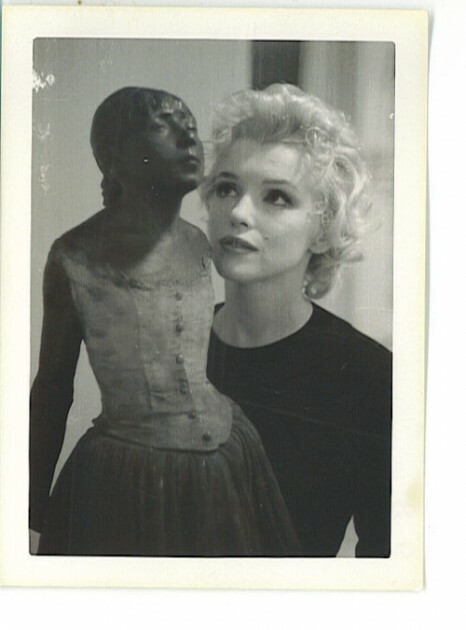 Does anyone know what becaome of Marilyn’s art collection? Was it dispersed along with other parts of her estate?